DeMatha Catholic and Colerain join this week's Top 25. No. 4 Miami Central and No. 12 Carol City both win setting up a huge district showdown on Oct. 26. There wasn't much movement in this week's Top 25 as 23 teams stayed in the same spot and two new schools join this week's rankings. DeMatha (Hyattsville, Md.) went from the "Next 5" group to No. 23 after an impressive 32-2 win over Our Lady of Good Counsel (Olney, Md.) to reel off its sixth consecutive victory. The defense was lights out forcing five turnovers. Nick Cross, a 2019 Florida State commit, set the tone early returning a fumble for a score and 2019 Alabama commit DeMarcco Hellams was a huge factor on both sides of the ball. Up next for the Stags is a monster WCAC showdown against No. 3 St. John's (Washington, D.C.). 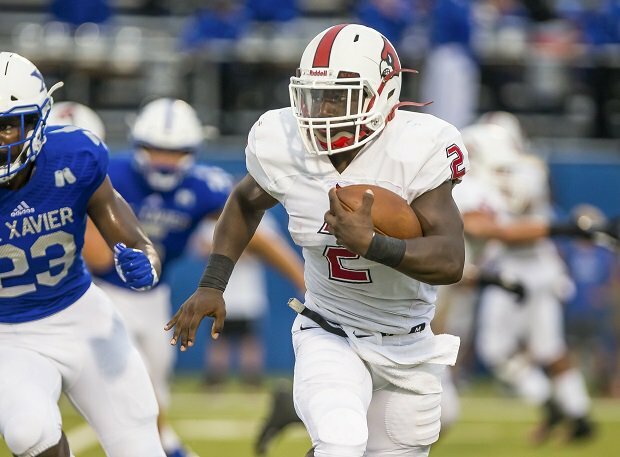 Colerain (Cincinnati) was the other new team to join this week's Top 25 after winning its ninth consecutive game and clinching at least a share of the Greater Miami Conference league title with a 55-27 win over Fairfield (Ohio). It was the Cardinals' 74th straight league win and 19th consecutive league title. Colerain plays Lakota West (West Chester, Ohio) to close out the regular season on Oct. 26 before the Ohio Division-I state playoffs begin. See the video above for a complete look at this week's Xcellent 25 rankings presented by the Army National Guard. No. 5 Mater Dei (Santa Ana, Calif.) bounced back in a strong way dominating a legit JSerra Catholic (San Juan Capistrano, Calif.) team, rolling to a 42-7 win behind a big-time defensive performance. Elias Ricks, the No. 1 cornerback from 2020, recorded his fifth interception of the season and 2020 Oklahoma commit Darion Green-Warren finished the night with two picks. The top rated dual-threat quarterback in 2020, Bryce Young, threw for over 300 yards and three touchdowns in the blowout win. No. 1 St. John Bosco (Bellflower, Calif.) improved to 9-0 and clinched at least a share of the Trinity League title with a 49-14 win over Santa Margarita (Calif.). DJ Uiagalelei had over 300 yards of total offense and 2019 Stanford commit Colby Bowman hauled in three receptions for 142 yards and a score. The Braves close out the regular season against Servite (Anaheim, Calif.) before the CIF Southern Section Division-I playoffs begin. A team that will be the biggest threat to Mater Dei and St. John Bosco in the playoffs is the No. 8 team in the Top 25 — Centennial (Corona, Calif.). The Huskies hit the 77 point mark for the third time this season in their 80-0 shutout win over King (Riverside, Calif.). Corona Centennial averages more than 50 points per game and has held six of its nine opponents to seven points or less. The Indiana 6A state playoffs begin this week and No. 14 Warren Central (Indianapolis) takes on the defending state champs Ben Davis (Indianapolis) to begin its quest for its ninth state title. Jayden George is trying to become the third George to win a state championship as the starting quarterback for the Indiana power. His older brother Jeff George Jr. did it in 2013 and the former No. 1 pick in the 1990 NFL draft Jeff George led the Warriors to a state title in 1984 and 1985.